I really love the way you've been doing Thor's leg wrappings lately. And the reflections on Wonder-Man's goggles looks really cool. Awesome! A great Sunday afternoon surprise. Wonderful piece JB. When I opened the thread to see the art I knew I would be impressed. but when I saw it an interesting feeling came over me. I was mildly disappoint with what I saw. I quickly thought where the heck did that feeling come from. I realized it was because there wasn't this amazing background to see. By no means am I knocking this piece. I think it looks great. I've come to enjoy your backgrounds so much more than the figures. They have impressed me so much. It wasn't really to this moment that it even occurred to me. Still that being said an exciting piece of work JB. The request asks for "a scene of devastation," but I guessed the customer didn't really want the figures to be three inches tall so we could se a bunch of broken buildings. I don't mean to slight Wonder Man and the background devastation, both of which are fantastic, but Thor is just WOW. I love all the heavy black - and the sheer *heaviness* of this piece. It really feels like Simon's just been socked into a building - and it HURT. WOW!!! I can feel that punch. In the face spectacular! Thor owed him that punch after Simon caught him with one in their first meeting..
By the way this is dated 1 month into the future. AWESOME!!! Thor's punch can virtually be felt off the page! No it isn't. Where have YOU been? 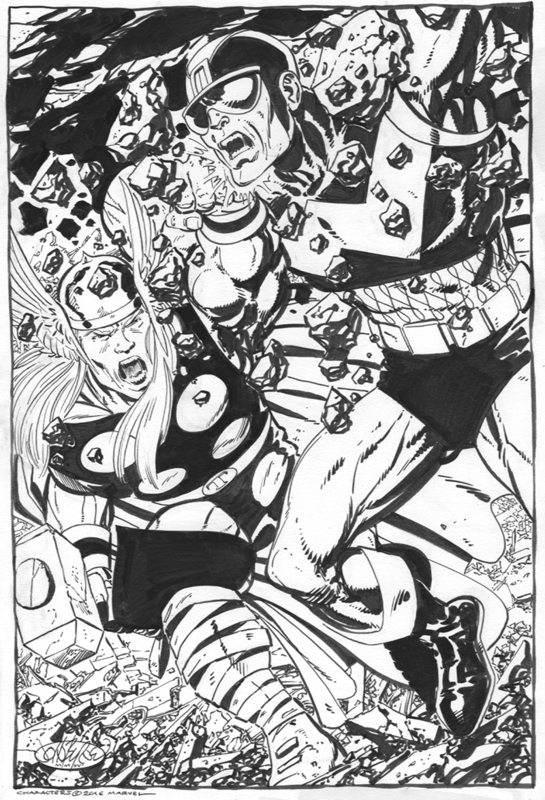 Thor punched poor Simon into May. I really like how the muscle definition on Simon and Thor's left arm looks. Is this Pitt brush pen? the negative. What's up with that? Quite possibly the best Thor you've drawn, JB! I love how far in the camera is. It really puts you right there with the characters! This is great! Wonder Man is one of my favorites! Is this the first time you have drawn this particular Wonder Man costume for a commission. What about this version do you like since you had a choice between the 1st two. JB has long said his style isn't "big" enough for Thor. Nice and weighty punch. If I stare at it long enough, the rubble seems to move... May not be good for my eyes! JB, did you do the redesign on Wonder Man from the safari jacket to the black-with-red-W? Nope. I've contributed to designs for quite a few characters over the years, but Wonder Man was not one of them.